I live in an awesome place but Seattle doesn't seem to be known for its mozzarella. I had been looking for "Fior di Latte" mozzarella and all of the local cheese mongers try and hand me something different from the last cheese monger. 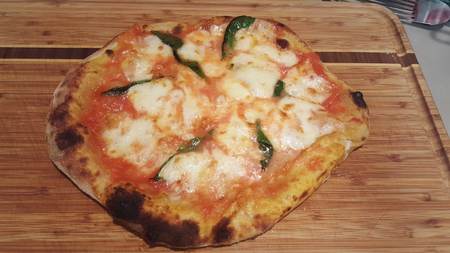 So last night I put Ovalini on a Margherita pizza. I loved the sauce on the Margherita. I love the wonderful carmalization that the broiler method produced but unfortunately, I had the equivalent of tomato soup on a pizza. Was it because of the cheese? I suspect that the excess liquid came from the cheese. What is the correct cheese (and where can I get it)? I'd like to do this pie again and be as successful as the others that I've cooked. Traditional Authentic Napoletan style Margherita IS soupy. The sauce and cheese are your culprits. For De latte, Ovalini, Boccacini, Buffa Mozzarella all have a high moisture content. The are packaged in their brine. But there are a few things from my experience that you can try if you want a Margherita that comes out less soupy. 1) Let your form of fresh Mozzarella sit out on paper towels for a while. You could also gently squeeze out some of the moisture. 2) Check your ratio of sauce to cheese. If you use a lot of sauce, cut back on the cheese. If you use more cheese, cut back on the sauce. But the rule with fresh that contains a lot moisture is less is more. 3) Is your sauce thick or thin? Thiner sauce with fresh mozzarella tends to be soupier. Try a thicker sauce. 4) Lastly what temperature are you cooking at? Do you cook on a stone? The time and temp you cook at can affect the soup factor as well. True Napoletan is 900° for 90 seconds. It's gonna be soupier. Most home ovens don't get close to that. So it can be tricky. Long story short, I'd try using a thicker sauce, squeeze out exess moisture and cook at a higher or highest temp your oven can handle. Good luck! I ran this exactly as stated in "The Pizza Bible" using the broiler method (500 degree preheat and then switching to the broiler at 525 degrees). The delicious sauce looked just like in the photo. And it was baked on a pair of stones. I think that maybe I should move the cook outside to my grill which has a pizza stone insert because I can get a higher temperature. I wouldn't mind the soupiness except that it didn't allow my crust to properly bake. It was wet, undercooked and gummy. I wonder, if using the broiler method in the future, the pizza should be cooked in a fashion that is consistent with the other pizzas and then finished under the broiler at the end. Great answer Scott. You said everything I was about to say! For the sauce, when I open a can of San Marzanos, I empty it into a fine mesh strainer with a bowl under neat. I'll poke the some holes with a fork to release some of the juices from within the tomatoes. I let this drain for about 30 minutes. Then I make my sauce. If it's too thick, I add back some water. No right answer here, it's just preference. 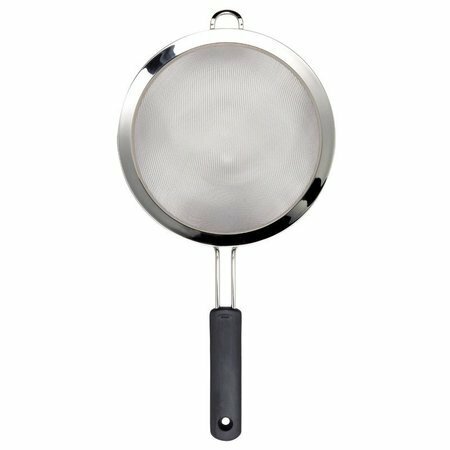 Attached is a picture of the strainer I use. I have the 6" version, but would recommend the 8". It'll fit a whole more easily. When it comes to fior di latte, get the freshest cheese possible. At supermarkets, you can check the packed on / best by date and find the newest ones. Fior di latte is very firm when it's fresh. As it gets older, it starts absorbing the moisture. Before putting it on a pizza, I'll slice or tear into pieces and place it between paper towels. Sometimes I'll place a cutting board on top to speed up the process. Thank you — both of you! Raj: I made the sauce by the book, however I do think that doing what you said, "poking holes with a fork...drain for 30 minutes" is the way to go. A thicker sauce will be helpful. I also drained the mozzarella on a paper towel. Scott: I had another crust so I made a pie for lunch and baked it on my grill. It's a Stok and has a pizza stone insert. It can get up to 700° but you need to give it more cooking time. In the end, it was still a little soupy – but not as bad. I didn't use as much mozzarella and discovered that the cheese wasn't weeping, as I had previously thought. (My lunch seriously needed more cheese!) There clearly was too much liquid in the sauce (I'll be making Raj's version of a thicker sauce next time). Temperature and liquid are the keys to this. The broiler broke my heart (and by "heart" I mean pizza! ).